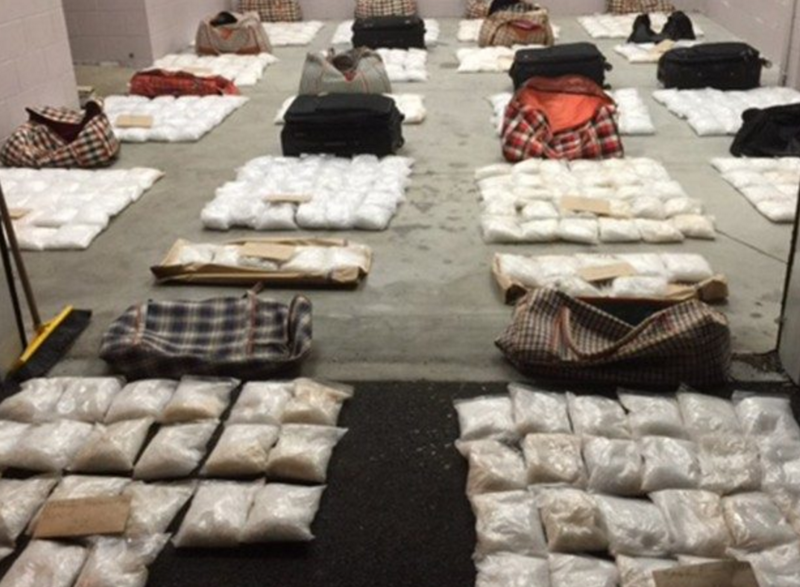 Outperforming the entire 2015 year gross meth seizure amount by 114kg in just one bust. At 448 kilograms the methamphetamine seizure by Northland Police is estimated to be worth a staggering $NZ448 million. That’s a whopping $1 million per kg. “This is without a doubt, the largest ever seizure of methamphetamine in New Zealand, and what is so great about this is that it’s not only the result of hard work by the Northland Police, but it’s the result of information we got from the community,” said superintendent Russell Le Prou. Local residents became suspicious when three men began offering them wads of cash to help launch a boat from a remote Ninety Mile Beach. In the last year, the neighbouring Australian population ranks as one of the highest users of ice in the world, with 2 per cent of the population using Methamphetamine in the last 12 months. America lagging behind with a low 0.5 per cent and Britain at around 1 per cent. It seems the remoteness of Australia and the high prices attract international drug smugglers trying to cash in on the Australian methamphetamine value. Meth Lab are now considered one of Australia’s biggest concerns with approximately 1000 meth labs found yearly. However with only a small proportion of labs being found, it’s estimated there are upto 10 times more labs currenlty setup in homes around Australia with a large portion being in rental properties. DIY Home Meth Test Kits are a now available so home owners and landlords can test properties after a tenant or before signing a contract on a house. Result within 5mins, easy to use, a quick meth check could save you $50,000 + in meth lab clean up costs. ICE PRICE: At $1 million per kg or $1000 per gram – Crystal Meth makes gold prices look cheap. Jessica Fogarty appeared worried while waiting for her sentencing in the Wangaratta County Court on Tuesday over charges of trafficking and masterminding Meth Empire in Wangaratta Victoria near the boarder of NSW. She has been charged with trading drugs and guns as part of her multi-million dollar from 2010 to 2014. Receiveing a sentence of seven years behind bars and given a non-parol period of four and a half years. In recent year Wangaratta has become a hot spot for Meth like many Victorian regional towns targeted by drug dealers. If you’re looking for a meth dealer, head for the regional areas now overcome with meth addicts and social problems. What does it cost to clean up after finding your house has been contaminated by a meth lab? Each property is different depending on the level of contamination and how far spread the contamination is. Often, its not just the room in which the meth was discovered or produced that is contaminated. Toxic gases from production can spread over porous surfaces, into carpets and through air vents – all throughout the house. Full decontamination can cost 10s of thousands of dollars in some cases. How long does a property stay contaminated from Meth residue? There has been little research into contamination levels over time however there have been several cases reported in australia and overseas where tenants have become sick after living in contaminated properties (unbeknown to them). This can occur months and even years after the meth lab is gone. Methamphetamine is usually the least toxic of the chemicals found in a meth house – however its usually the hardest to clean up. The chemical precursors (of which there can be up to 32) are the more concerning when it comes to toxicity and ability to stay present for longest. How do you clean a meth house? Each house is different depending on the severity and frequency of the use or production. Some houses have been found to have in excess of 500ppm of meth – just from swabs on the walls. This may not sounds like much – but the ‘healthy’ limit is 1/100th of that. Often the toxic gases not only contaminate the room in which the production occurred, but travel through air vents, heaters, and any other means of airborne transportation. Significant contamination may require removal of some porous surfaces. This could include your furniture, curtains and other house hold items which may have been subject to secondary contamination even after the source of the meth is no longer in the property. Meth in your house – who is responsible? In Australia, the owner of the property has an obligation to ensure the property is safe for future use. However, at this stage there are no laws enforcing disclosure of previous meth activity that may have occurred in the property. This leaves owners, real estate agents and new tenants or home buyers exposed. Contamination may have occurred at any time in the properties history, and the toxic chemicals are not ones that disappear quickly – they can continue to have adverse effects for years. Its safer to be sure that you’re not selling, renting or living in a potentially contaminated property – some councils will recommend a swab test to be submitted in higher risk areas. As the number of drug labs – discovered and undiscovered continues to increase – tentants are increasingly at higher risk . Why should I test for meth in my home? Most people when they purchase or rent a home are unaware of previous tenants or owners use of the property. Often, existing owners will paint walls and clean carpets in an attempt to remove any visible damage or discolouration – however this does not remove the chemical contamination. Long-term exposure to meth – even in small quantities has been shown to have adverse health effects. Imagine if your child was taking in toxic chemicals every time they were crawling on the floor. What are the Dangers & Side-Effects of Living in a Meth House? 2nd and 3rd hand meth contact has had little research, however it is generally safe to assume that chronic ,or long term exporsure has similar risks to 1st hand use – perhaps on a smaller scale. Methamphetamine in pure form is a white crystalline substance which vapourises when heating – most meth users smoke the crystals. When smoked, the vapour spreads and reforms on surfaces as crystal. This can then be ingested by contact through skin, or by coming into contact with surfaces through mouth, eyes and nose. It can be difficult to prove the origin of illness when it is related to a contaminated surface or home, as the symptoms may seem fairly common to most. The bad news here is that, if you have just moved into a property and discovered later on that the property was in fact used to illegally manufacture drugs: Meth or Ice, there is a good chance that all of your contents are now contaminated. Not only will most of your contents need to be disposed of but so will all the property furnishings including: carpets, curtains, fans & air-conditioners, sometimes kitchen bench tops will need to be removed also. If the plasterboard walls were repainted after being contaminated, they will need to be ripped out and disposed of as they cannot be cleaned once painted. What Happens If Your Property Tests Positive For Meth? If the police raided the property and found ingredients and or equipment used to manufacture drugs, they will in most cases inform your local council. The local council will inform the land owner by formal letter that there property has been likely contaminated from a clandestine drug lab or the ingredients commonly used in illegal drug manufacturing. As a result your property will be deemed a contaminated site until validation testing can prove there is no longer contamination present. , A notice to remediate the property will be issued and enforced by local government.